We’ll be starting a series of car features from local car enthusiasts. The purpose is to highlight non commercial builds that everyday people who work hard and build these cars for themselves. There’s no doubt there incredible builds in the automotive world from shops and such, but those cars get plenty of spotlight. Here we will shed some light to some of the car builds that are more to home and down to the roots. This post features two local San Diego guys: Jeff Correa and Warren Falaminiano. My cousin Joey from over at The Chronicles, a Honda dedicated blog, introduced me to Jeff and we’ve been trying to set something up for a couple months. When we finally got together, he brought out his friend Warren and I shot both their cars. I started out in the Honda scene so I’m still pretty up to date with Hondas. I’ve felt that the best time of Acura was 2004-2008 when the all the cars across the range were quite nice. Warren’s TSX is a prime example of a nice car from the factory modified tastefully. His complete Mugen kit really makes the car stand out without being too gaudy. The black housed JDM headlights is a nice touch. The white TE37s matches the car in an elegant fashion. Next we have Jeff’s eighth generation Honda Civic. When I first saw these Civics come out, I wanted one just to do that JDM conversion because I really disliked the way they looked in comparison to the Japanese counterpart. Of course as soon as they hit market, so many people went and bought one. Instead of doing a costly conversion, Jeff made modifications that made the existing car flow nicer. His attention to details made his daily driver quite the nice build. This may possibly be the lowest eighth generation Civic in San Diego at the moment. Weds Kranze wheels are an interesting choice. 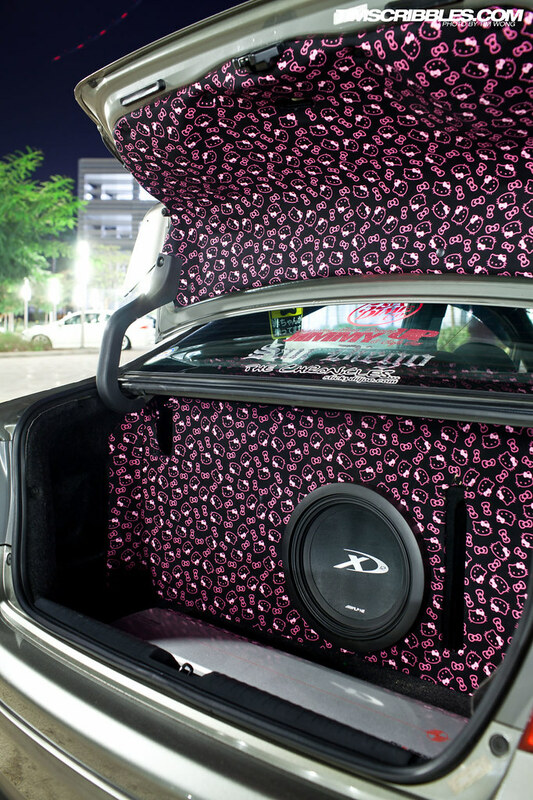 His custom wrapped trunk in Hello Kitty fabric is pretty unique.